Tue., Feb. 6, 2018, 2:22 p.m.
SAN FRANCISCO – Home run king Barry Bonds will have his No. 25 jersey retired this August by the San Francisco Giants when his former Pittsburgh Pirates are in town. The Giants announced Tuesday they would hold a ceremony to honor the former slugger and seven-time NL MVP on Aug. 11. He will become only the 12th player from the New York or San Francisco Giants to have his number retired. Bonds, now 53 and an adviser in the club’s front office, broke Hank Aaron’s home run record with No. 756 on Aug. 7, 2007. He finished his 22-year big league career that season with 762 homers and under a cloud of steroids allegations. 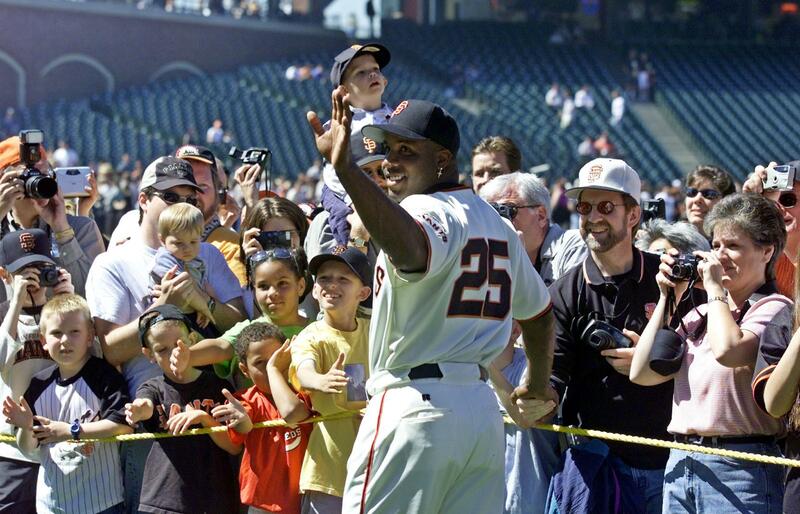 On the 10th anniversary of his record-breaking blast, Bonds said he wished he could have played one more season with San Francisco and believes he might have reached 800 homers. “For me to have played on the same field as them, wear the same uniform and now have my number retired, joining Willie and the other Giants legends is extremely special. Number 25 has meant a lot to me throughout my career and it is even more special that I got to share that with my dad,” he said. Bonds joins an elite list of Giants to receive the distinction: Orlando Cepeda (30), Juan Marichal (27), Mays (24), Willie McCovey (44) and Gaylord Perry (36) with San Francisco. Members of the New York Giants were Bill Terry (3), Mel Ott (4), Carl Hubbell (11) and Monte Irvin (20). Christy Mathewson and John McGraw were honored despite playing before numbers were on uniforms. In July 2015, Bonds said he had a huge “weight lifted” when federal prosecutors dropped what was left of their criminal case against him after a nearly decade-long steroids prosecution. He was on 56.4 percent of Hall of Fame ballots for the 2018 class. He drew 36.2 percent in his initial appearance of 2013. Published: Feb. 6, 2018, 2:22 p.m.